A new protest in the center of the Capital took place this morning. Andrei Năstase and his supporters, dissatisfied with the decision of the Supreme Court of Justice, chanted in front of the Town Hall. The manifestation did not go without incidents. The PPDA leader urged people to go into the City Hall building, which caused them to stumble with the police. After blaming the police, the protesters blocked the entrance to the City Hall. Later, the demonstrators, headed by Andrei Năstase and Maia Sandu, marched in circles on Stephen the Great Boulevard. "We do not stay at one place. We move forward, we move to regain our democracy back," a protester said. A driver wanted to turn from Stefan cel Mare Boulevard to Vlaicu Pârcălab when he was attacked by a protester. The latter probably misunderstood the democratic rules and his right to protest peacefully. The case is being investigated by the police, and the guilty person may face a fine of up to 1,500 lei or work for the benefit of the community. 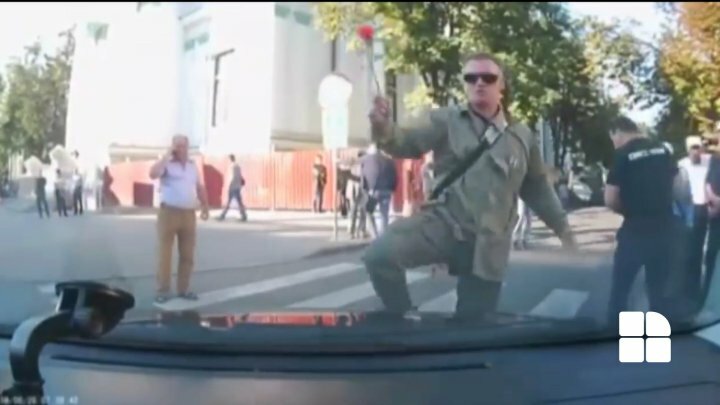 "In this case, actions are being taken in order to establish the identity of the man who hit the car and a contravention procedure for hooliganism was initiated not too seriously," said Mariana Beţivu, PGI press officer. "You can protest on Saturday and Sunday how you want. But now people need to work, we are late for work because of traffic". Due to the protest, the routes of several trolleybuses and minibuses were also modified.